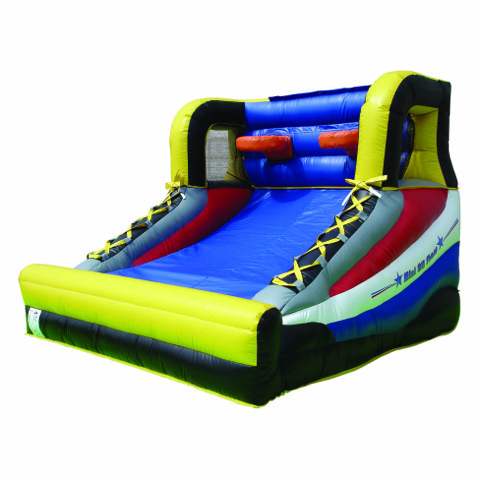 The Mini All-Stars inflatable basketball game from The Party Connection is the perfect addition to any indoor or outdoor event. Players will be lining up to take their shot at the dual hoops, which allow for plenty of action, fun and competitive spirit as players shoot it out with mini basketballs. This inflatable basketball game is designed on both sides to look like the profile of a high-top basketball shoe, with a little wit in the lace-ups. A red, white, blue and yellow color scheme will match any party theme. With a total height of just under 8 feet, this two-player, miniature basketball game is perfectly portable and ideal for venues that have a smaller space.